At my CrossFit gy m, everyone wants fab abs that you can’t help but notice. But even with thousands of crunches, planks, single-armed overhead squats and other ab-blasting exercises, most athletes can feel that their core is stronger but they can’t see any definition. Melissa, one of the best CrossFitter’s at my gym who has rock-hard abs, reminds those who complain about their pony keg-middles. “Abs are made in the kitchen, not the gym,” she says. I couldn’t agree more! That’s because the only way to see your abs is to get your body fat down so there’s not so much body fat covering up your hard work. There’s more than cosmetic reasons to care about your middle: Carrying extra fat around your middle is harmful to your health. Period. Whether you’re sporting a muffin top or a full on Homer Simpson, it’s a sign that you have too much deeply deposited fat in your abdomen. This type of deep belly fat, (called visceral fat, central fat, or intra-abdominal fat) is liked to diabetes, high cholesterol, high triglycerides, high blood pressure and insulin resistance. A recent study presented at the Endocrine Society’s annual meeting, Barbara Gower, Ph.D., from the University of Alabama, Birmingham, revealed results from her study which included 69 overweight men and women who were put on a weight maintenance diet for eight weeks and then a weight reduction diet for eight weeks. The two different diet interventions tested were a typical US diet (comprised of 55% calories from carbs, 27% fat and 18% protein) versus a diet that provided 43% of calories form carbs, 39% from fat and 18% from protein. The diets were matched for each subjects’ caloric intake to assure no weight loss during the first phase of the study. In the second phase, each subject’s diet was reduced by 1,000 calories a day and all food was provided during the total duration of the study. The researchers used the most advanced body composition scans, called DEXA, to monitor the total body fat of the subjects before and after each diet trial. Despite all the “Abs Diet” books and special ab-flattening exercises, any weight loss will result in losing belly fat because abdominal fat is readily mobilized when you reduce your calories lower than what you burn off (read: lose weight). In fact, a modest reduction in body weight can lead to significant reductions in belly fat. Other human clinical trials have also found results consistent with the UAB researchers: Diets that are lower in carbohydrates and higher in protein and fat (40% calories from carbs, 30% from fat and 30% from protein) may help reduce visceral fat better than typical high-carb diets. 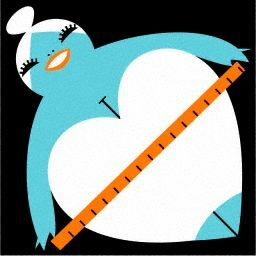 Women with waists 35 inches or more and men whose waists are 40 inches or greater are at the greatest risk for health problems related to excess visceral fat. Even if your waist is several inches smaller than those benchmarks, it’s best to try to keep your waist from creeping up during your adult life. But for women who have sleek, visible ab muscles, their waist circumference measurements are generally below 30 inches. Get our your tape measure, record your waist measurement and make a plan to check it every month for the next three months and try the diet changes outlined above. For inspiration…pull out a pair of “skinny” jeans from your closet and keep them where you can see them for added waist-management motivation!